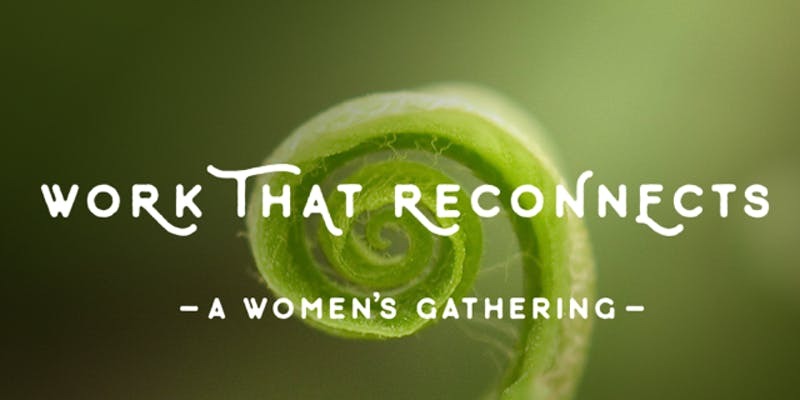 We gather again as a community of women to do the Work That Reconnects. As we keep coming back together we deepen in the work and the way it moves in our lives. We journey into the spiral to explore the many layers of our belonging as we train together for these times of uncertainty~ to be present, wholehearted, and to radically open to our own lives and our changing world. The foundation of our day is the Work That Reconnects, a set of practices and interactive work developed by our teacher Dr. Joanna Macy. This work reveals that our grief, anger, and fear are all healthy responses to our fierce love for the world. Welcoming the full range of experiences we will move around the spiral of the Work That Reconnects~ gratitude, honoring our pain, seeing with new eyes, and going forth. This will be a nourishing and open hearted day in the company of other women. No previous experience necessary. ALL self identified women are welcome- across the vast gender spectrum. Come as you are! Layers to be comfortable practicing inside and outside, temps can still be cool in the valley in May. There is a sliding scale for registration cost – from $40, which is a scholarship, to $120, which gives extra for scholarships. Please choose whatever option is best for you. Registration covers your attendance and dinner. The profits from this event go towards building the program. No one will be turned away for lack of funds, if you don’t see a registration option that works for you please email Kaye. Please register online thru eventbrite. Please contact Kaye with questions or to be added to the mailing list kaye@broadforkfarmtl.com. The workshop cost includes a light dinner of soup and bread at 5pm, as we relax and visit after the workshop. Sara Mains will be be leading us in a 5Rythms movement practice from 7-9pm at the Abbey for $15. We hope you will stay and dance, where we move to the direct experience of our bodies as a teacher. Payment at the door. Erika is honored to be stewarding the work of her teacher Joanna Macy’s Work that Reconnects and carrying the female lineage of her ancestors into her work with women. At fifty her multi faith, inter and intrapersonal journey continues to be her practice for living and learning how to die in the midst of life. In other circles, Erika dances, sings, gathers with Mama Bears to be nurtured and act with courage and practices living wholeheartedly with her family CJ and their daughter Karen. Kaye is a homesteader in Trout Lake, an educator, and mother of three with her partner Adam. She is a student of relationships, reality, and complexity ~ as understood through the lens of the dharma and natural systems. Kaye has her MSc in Holistic Science from Schumacher College, and is a student of Tibetan Buddhism. Her study of Vajrayana is in the lineage of Chogyam Trungpa and Dharma Ocean. Joanna Macy has been Kaye’s root teacher and collaborator since 2004. We will gather again on November 30 and December 1, 2019.